The Origins of Karate can be traced back as far as the Greek Olympic games of 776 B.C. 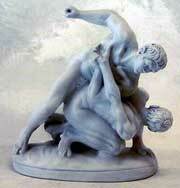 An event called the Pankration, which was a mixture of wrestling and boxing, usually resulted in the winner being alive at the end of the match. Alexander the Great's conquest of India had led to this type of contest influencing Buddhist Missionaries who saw the potential of unarmed combat as a way of protecting themselves on their travels without the use of forbidden weapons. As Buddhism spread into China, other sects grasped the essence of the 'Empty Hand' and modified it according to creed and temperament. Karate spread through China, across the Ryu Kyu Islands and finally to the chain's main land-mass, Okinawa. Wado-Ryu's origins can actually be traced to a Chinese Monk, Chin Genpin, who is reputed to have introduced Kempo (Fist Art) into Japan in the 17th Century. Later, the Shindo Yoshin-Ryu system set the basis for the Wado-Ryu style. It is unique amongst the other Ju-Jitsu systems as it stresses the art of Atemi or striking the vital and vulnerable parts of the body rather than the traditional Jitsu of throwing or locking the limbs. The originator of this style. Master Yoshitoki Akiyama, developed the underlying principal after visiting China to study medicine. Whilst he was there he started training in a form of Atemi. On his return to Japan he continued his practice of Atemi but feeling a spiritual emptiness embarked upon a period of intense meditation in his search of enlightenment. At the end of a period of 100 days of rigorous meditation he happened to gaze upon a willow tree. It was snowing at this time and Akiyama was struck by how the branches of the tree would bend as the weight of the snow built up on them and how the snow would slide off once the bough was loaded with enough weight. Had the tree not yielded to the weight of the snow the branches would surely have snapped. This seemingly mundane observation enthused Akiyama and he used it as the basis for a new theory of Karate. There were other senseis who developed the theory as time went on until Master Hinori Ohtsuka formalised the Wado-Ryu techniques: but the underlying ethos remained the same - a basic philosophy of non-confrontation either physically or mentally. Karate did not come to mainland Japan until 1921 when the Okinawan Master. Ginchin Funakoshi, travelled there. Hinori Ohtsuka - the founder of Wado-Ryu - was an accomplished Ju-Jitsu expert who had received his license to teach from Tatsusaburo Nakayama (the then head of the Shindo Yoshin-Ryu style). Hinori Ohtsuka made the pilgimage to train with Master Funakoshi in the new area of Tode (Karate) which Funakoshi had brought from Okinawa. Ohtsuka was so adept and quick to learn that Funakoshi could not believe that Ohtsuka had not trained in Karate before. He so impressed Master Funakoshi that he seconded him in many demonstrations in Japan to promote the new art. It was in 1935 that Budo - Japan's National Governing Body for the martial arts - recognised the style of Wado-Ryu and the Way of Peace style was born. Have you always wanted to take up karate but always found a reason not to join?